Well, Toto, I don't think we're in Kansas anymore. Or, more to the point, we're no longer on our lonely, rough, 1000-mile Pacific crossing anymore. We've arrived at the Phoenix Islands (and in full Technicolor!). We're currently moored at Nikumaroro at the Western edge of the islands, and it's amazing how different today is from yesterday. Yesterday, we were all still battling rough seas (with up to 20-ft waves) and weak stomachs, and were fighting just to maintain sanity on our long voyage. Today, we're all fresh and excited to be here… and to be doing science, taking photos, and exploring PIPA together. 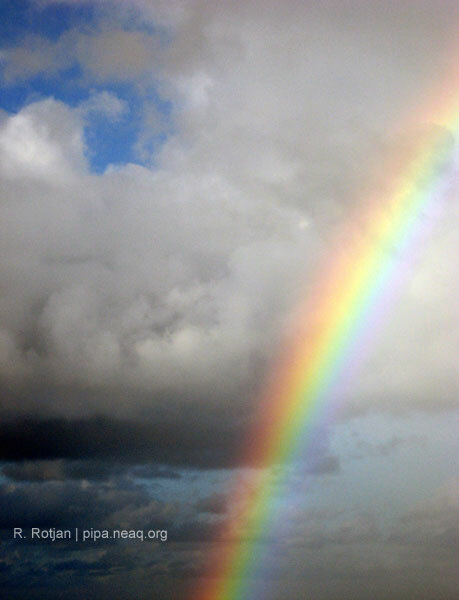 We knew we were getting close when we passed through a full rainbow, and the seas calmed down to a gentle roll. 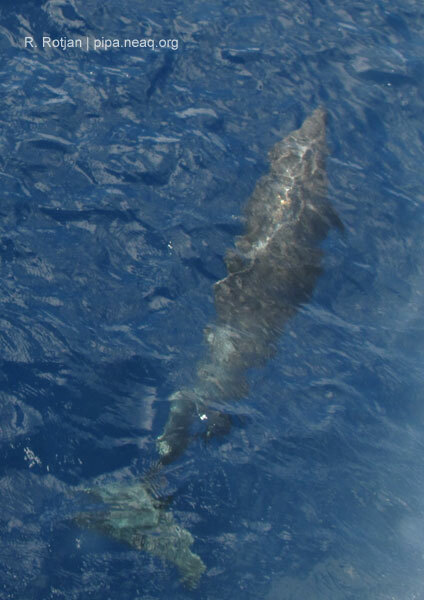 Soon after, bottlenose dolphins graced our bow. When we finally arrived at Nikamaroro, we were again greeted by dolphins, who stayed with us all afternoon until the sun set. Wasting time is not an option here, so we jumped right into a 3-dive day. 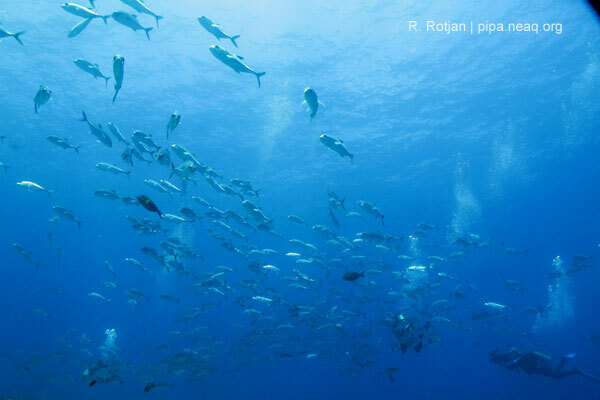 We saw an astounding amount of fish--both high diversity and high abundance. Les and Stuart have already documented a species of parrotfish (red parrotfish) never before reported in the Phoenix Islands. 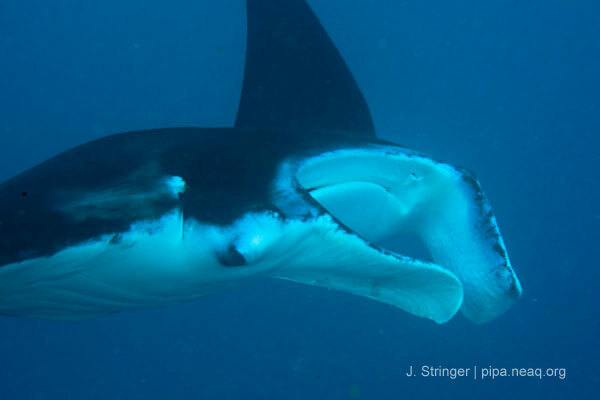 Other sightings included a manta ray, 3 shark species, 2 moray eels, and large schools of barracuda and other fish species. On the coral side of things, David and I had a somewhat different experience. 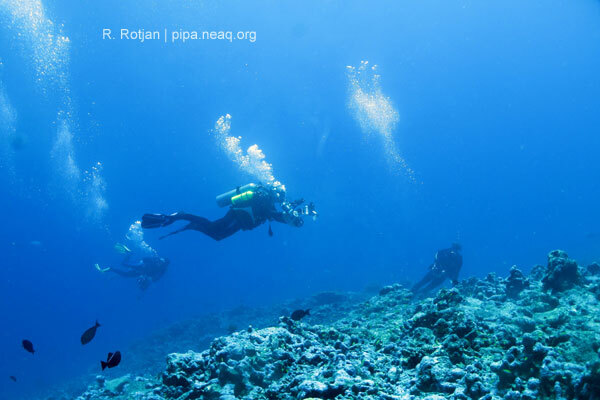 We documented around a dozen genera, but saw more rubble than live coral. Perhaps not surprising, since this area has high wave energy, and is still recovering from a catastrophic bleaching event (described a few posts ago by David). Still, it's too soon to tell the current state of affairs--we only dove one side of the island, and we have much more to explore before making any conclusions. It's encouraging, however, that there are so many herbivores. 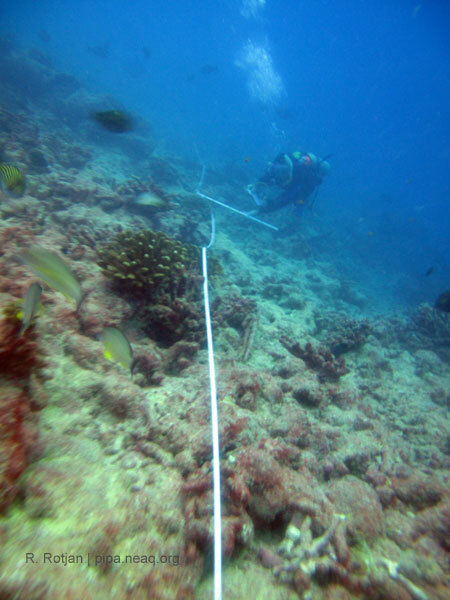 The substrate is tightly cropped and dominated by crustose coralline algae (CCA), which facilitates coral recruitment. You can see the pink CCA in the redband parrotfish photo above (photo credit to Stuart Sandin for that shot). 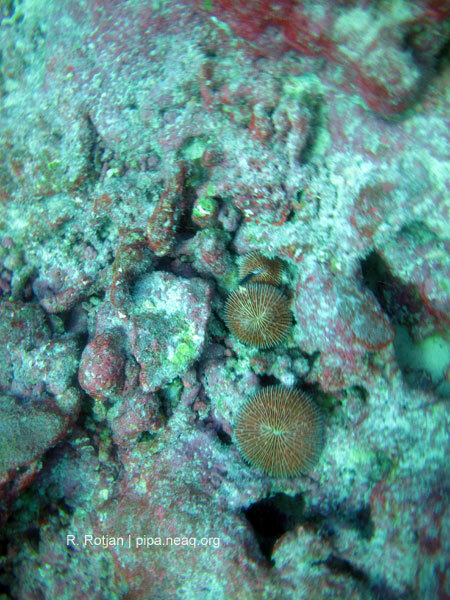 Of course, it's also interesting to observe the corallivores (organisms that consume live coral). Grazing scars on live coral abound, and we'll be investigating the impacts of corallivory further as the trip progresses. In the meantime, we're just thrilled to be here. Tonight was a welcome break from the norm. Everyone ate dinner! Better yet, we all ate together and excitedly discussed the discoveries of the day. The crew serenaded us with an old classic: "Happy Birthday," to Craig Cook (our MD). Happy Birthday, Craig! And now, we're all geeked out with our computers and field guides, double checking species identifications, entering data from the day, making data sheets for tomorrow, and just trying to process all of today's little treasures. After 6 long days, we've finally found the pot of gold at the end of the rainbow. Happy Birthday to Craig from his wife. No better present than to be on this expedition. Glad you are all out of the 20 foot waves. Will do. Calm seas are the best birthday present. :-) Thanks for reading!